The end of each year brings an onslaught of celebrations leading up to the biggest bash of the season to kick off a new year. We squeeze in parties and shopping and planning and socializing and traveling to visit family or to simply take advantage of the time off work. Parents of small children are making a list and checking it twice in an effort to keep kids happy with the latest toy that everyone must have. In the weeks leading up to the big unwrapping, the excitement builds fueled by sweets and chocolate and parties and late nights. 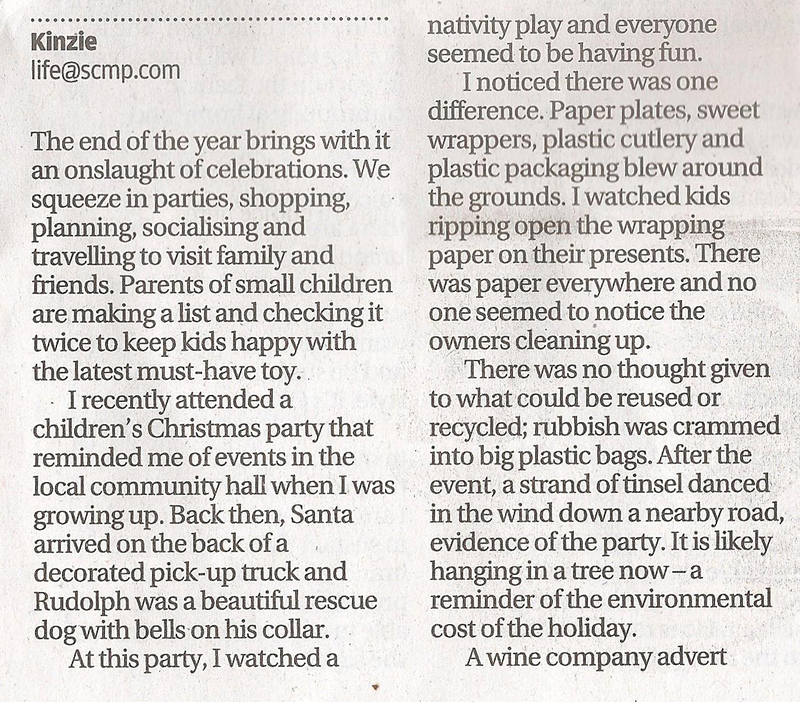 I attended a children’s Christmas party over the weekend that reminded me of events in the local community hall growing up. Although Santa arrived on the back of a decorated pickup and Rudolf took the form of a beautiful rescue dog wearing jingle bells on his collar, the atmosphere was familiar. The nativity play was chaotic and everyone seemed to be having fun. Then I noticed the difference. Paper plates, sweet wrappers, plastic cutlery and plastic packaging blew around the grounds. I watched the kids tear into their presents. Paper was everywhere and plastic bits went flying and no one seemed to notice the owners cleaning up after everyone. The scene reminded me of how we got ourselves into this waste situation in Hong Kong. With no attention given to what could be re-used or recycled, the rubbish quickly disappeared into big plastic bags – out of sight, out of mind. After the event, a single strand of tinsel danced in the wind down a nearby road, evidence of the nearby party. It is likely hanging in some tree, now – a timeless reminder of our holiday trash. Christmas in Hong Kong is an imported tradition. Until recently, decorations were for export and the holiday was a foreign affair. Christianity is growing, but the birthday celebration is still mainly commercial. A wine company advertisement featuring a series of transparent Santa Claus figures drinking red wine until his suit turns red sums up the local scene perfectly. The emphasis here is on the party — overindulging in the city famed for overindulgence. In the absence of spiritual traditions, the celebrations can feel a little empty and more like a perfect escape than a celebration. A time that highlights the importance family and friends can be a painful time for those whose family is far and friends are away. Waking up alone in a place where Christmas is just another bank holiday is the opposite of the family gathering around a tree on a decorated street in the neighborhood where everyone is doing the same. Having a supportive like-minded community can bring comfort, even if it is not religious. Presence becomes more important than presents. When we are willing to see that our life is not the same as the one on the greeting cards or the blockbuster movie or the television drama, we have the opportunity to create our own personal traditions … consciously.